Damien loves to count and identify shapes and colors. The Crew offered us an opportunity to review TouchMath's Homeschool program, and we were very exited to say yes and give Damien some new "big kid schoolwork." We received the Pre-K curriculum package, along with several of Touchmath's Manipulatives. While the Workmats and Teacher's Manual were something I needed to download and print, the manipulatives arrived via UPS late on a Friday afternoon. Damien was so excited to open the box; he kept asking "Package Man has schoolwork for me?" He was so disappointed that I made him put everything back in the box until Monday - I needed the weekend to print the workmats out. I don't necessarily believe that two-year-olds need a formal curriculum, but I have been looking for ready-to-use yet educational activities for Damien. As I read through the program's website and then the program itself, this definitely had potential to suit our family - the program is very well organized and very nearly "scripted." It provides a little "big kid" work to make Damien happy, without a lot of "prep work" for Mom. The core of the program is its modular workmat system. The Pre-K program contains six units that align themselves with preparing for the Kindergarten "Common Core" curriculum. I know there are many opinions on the common core concept, but I think that this is a good feature of the program. When Damien completes the program, he will be well prepared for kindergarten level work. If you are a homeschooler who has no plans of ever entering a traditional school system, this may not matter. However, since we are not certain that we are going to be "forever" homeschoolers, I really like that he will be prepared for a "regular" kindergarten. TouchMath's expectation is that the child will be able to work for a period in minutes up to two and a half times his age. The materials are also geared to a preschooler's abilities, and are not just "big kid work repackaged and marketed to a new audience." This meant the expectations for 2 year old Damien were very low - up to five minutes per day - and he would be able to complete an entire task in that time. This time expectation was right about on target with what he was willing to do. The work on the mats is well-sectioned to accommodate a short attention span - while we may have not completed an entire page in one day, we were able to complete one full task in that time. It also means we have progressed very slowly - after a month, we are only nearing the end of the first section on counting. However, I am not disappointed in Damien's progress, because it is well within the program's expectations. The Pre-K program is recommended for ages three to five. Our experience is that an older 2-year-old can also do well with it, as long as you remember to keep his age in mind. Since Damien is not quite three yet, we will just work slowly at his pace through the modules - this is definitely a program that I can see us using through next year. I like that the activities are very nearly scripted, so the only prep for me is to pull out the Workmat and shapes. At a few minutes each day, it is enough activity for him to feel like a big kid, but not so much to be an excess of work for Mom and not worth the effort for only a few minutes of activity. Because the program itself is a downloaded instead of a print book, the cost is kept to $59.95 for the program. Downloading the program and viewing on the computer was very simple. My one complaint is that it can be tricky to print and bind. The curriculum downloads as a single file. At one point, my printer ran out of paper (the entire program is over 200 pages!) and I didn't get back to it before the warning timed out. In order to continue printing, I had to figure out where I was, and the page number of the the workmats/instructions does not line up to the document's page number. While I also now have five extra workmats already printed and waiting, it's five more packets of paper to try not to lose. It is not something that would keep me from recommending the program, but I wish there was a more flexible way of printing the packets. In addition, the teacher's manual is interspersed with the student workmats. After printing, I divided the paper pile into individual units, and started to bind them. I didn't realize until I had three units bound together that Damien's work now had my sections bound with his. It was not difficult to fix, but it was frustrating. It probably could have been avoided if I was more attentive to the pages and not focused on dividing it off into units so we could get started, but I am including what happened as a "learn from our blunders" tidbit. When we finally dove in, Damien was so excited. The first module is focused on counting -- one of Damien's favorite activities. In the first section, the child learns the concept of one-to-one counting. At the end of the unit, the child will be able to understand "how many" one or three or ten is rather than just repeating/reciting numbers. We started with a workmat to learn "one." The mat had multiple kinds of fruit, with one of each type. 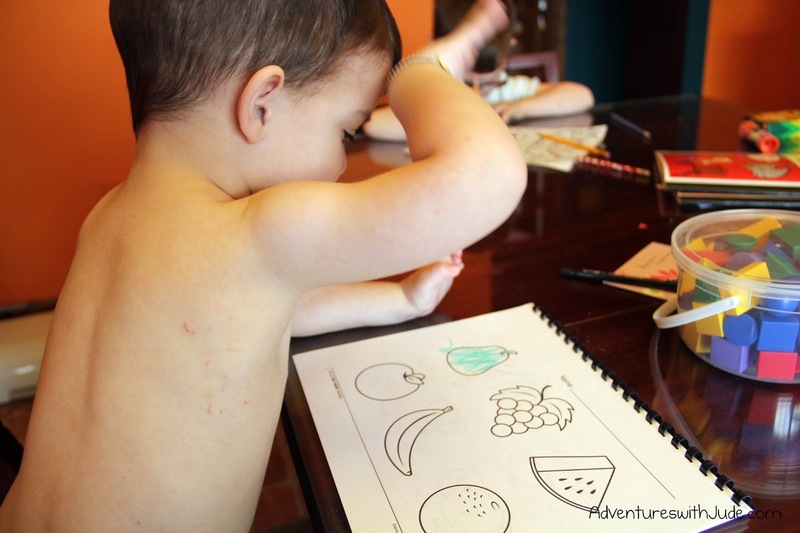 The hard part was actually stopping at ONE piece of fruit-- he wanted to count and color them all! For this program, manipulatives are not completely necessary to use the Workmats properly. For an older child with better pencil/crayon skills, the program will work without them. However, the manipulatives do really increase the learning potential, as using another sense (touch) really helps reinforce concepts. The program suggests things like coins or candies (a pet peeve of mine due to allergies) if you do not have/wish to purchase the TouchMath ones, but I really do like the company's offerings. We received several products in our box from the Package Man. We have mostly used the TouchShapes ($30.) with the Unit 1 workmats, but we also received the 3-D Numerals ($79.) and Texture Cards ($99.). We haven't had as much opportunity to use the latter two, since we are working for so short a period of time daily, but I am looking forward to using them as we get further into the program. We have used the TouchShapes almost daily. Here Damien is using them to sort groups of three. We used two different shapes - the circles as counters for the baby chicks, the hexagons to count the piggies. This workmat uses the TouchShapes as well. Without TouchShapes, the student could color the corresponding number of shapes on the right. With the TouchShapes, the student can maneuver the shapes from one side to the other before coloring. I liked using them instead of coloring, especially for a younger child, because he was forced to stop filling in the shapes in the right column after counting to five -- he was out of manipulatives. If he was coloring them, it would be very easy to just "keep on going." 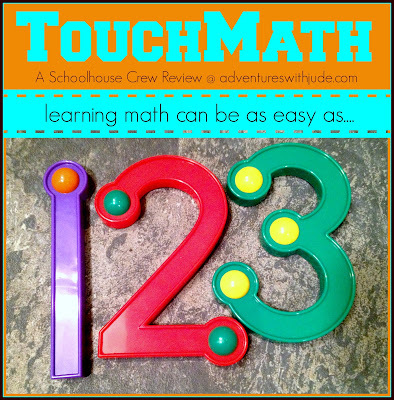 The TouchMath Homeschool Program encompasses grades Pre-K through 2nd grade. While Damien was the intended student for this review, Jude also merits mentioning. Jude recently had a check-in appointment with his Developmental Pediatrics specialist. When she asked what curricula we are using for Jude, I told her the (different publisher) Math program we were currently working with, but that I was using the Pre-K TouchMath for Damien and was considering switching Jude as well. She praised the program for being developmentally appropriate, and then proceeded to agree that we ought to consider the program for Jude, based on its tactile foundation. 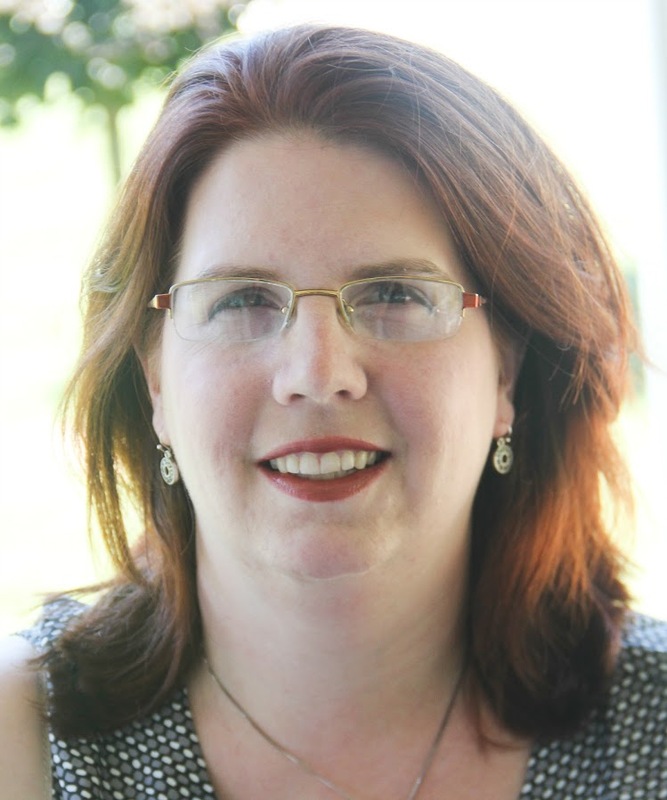 She has been a developmental pediatrician for over 20 years and has seen nearly every curriculum that is out there - both for neurotypical kids and delayed ones. When I have discussed curriculum choices before with her, she has been generally noncommittal with mostprograms I have brought up so I feel that if she is pointedly recommending something, it must be something that really is worth considering. Jude has already borrowed the 3-D numbers and they have helped him in his current program, so I may take her advice and consider purchasing the Kindergarten and/or First Grade programs for him as well. We reviewed the Pre-K program, but click through to see what other Crew members thought of the different levels. I'm definitely checking out the reviews to plan for next year! I am just so incredibly impressed with TouchMath! When we have finished the 1st grade materials, I'll be purchasing the PDF files for 2nd grade! Great details and pictures in your review! As a note, the TouchMath Home School Programs are available in the printed version for an additional $20 per Unit. You may contact TouchMath at 800-888-9191 to make arrangements. Hi Meg. We are thrilled that you and your family enjoyed the program, and are always happy to hear and see ways in which TouchMath positively impacts students! Thank you for the informative write-up and wonderful photos of the program in use in your home. Keep up the great work, Damien! 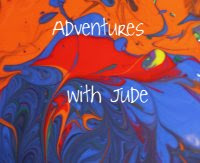 Please let us know if we can be of assistance in the future, and if you have questions in looking for materials that would be a good fit for Jude.